Kitchissippi now boasts only two secondary schools (Nepean and Notre Dame), so it could be surprising to some that at one time there were actually two others: Fisher Park of course, but also the lesser-known Champlain High School, in the Westboro Beach neighbourhood north of Scott and west of Island Park Drive. This article will look back at that school which was the alma matter for many in the community (including both of my parents). In a way it is unfortunate for former students that their former school is closed. In a year where many groups are celebrating anniversaries and reunions, it makes it a little more difficult to organize events like that when the school no longer exists. Champlain had a relatively short life span, and is best remembered for two things in particular: the contentious changeover to an all-French school; and Rider great Russ Jackson. Read on to learn (or relive) these memories and more. The land on which Champlain High was built had a rather unexciting existence before the high school arrived. Originally part of the east half of Nepean Township lot 31 in concession A, the land was sold repeatedly throughout the 19th century, passing through the hands of Loyalist Joshua Adams, the important Birch family of early pre-Westboro days, Senator James Skead, and others, eventually ending up in the portfolio of land syndicate Ottawa Land Association. The land was swampy, heavily treed, and not capable of development until the mid-20th century. The OLA eventually surrendered the land to Nepean Township due to unpaid taxes in 1937. When this part of Nepean was annexed to the City of Ottawa in 1950, it transferred to city ownership. It remained as vacant, surplus land to Ottawa into the 1960s. 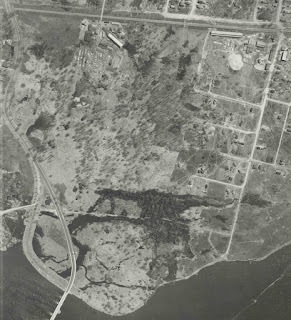 A view below from the summer of 1961 shows the future site just before clearing would have begun. As you can see, it was heavily treed. That's Ferndale and Selby at bottom, and the apartments on Clearview at top right. Champlain would of course be built in that treed area in-between. Island Park Drive is visible running at the very top of the photo. An old westward extension of Island Park Drive is visible along the left side of the photo, about where the Parkway would soon run. 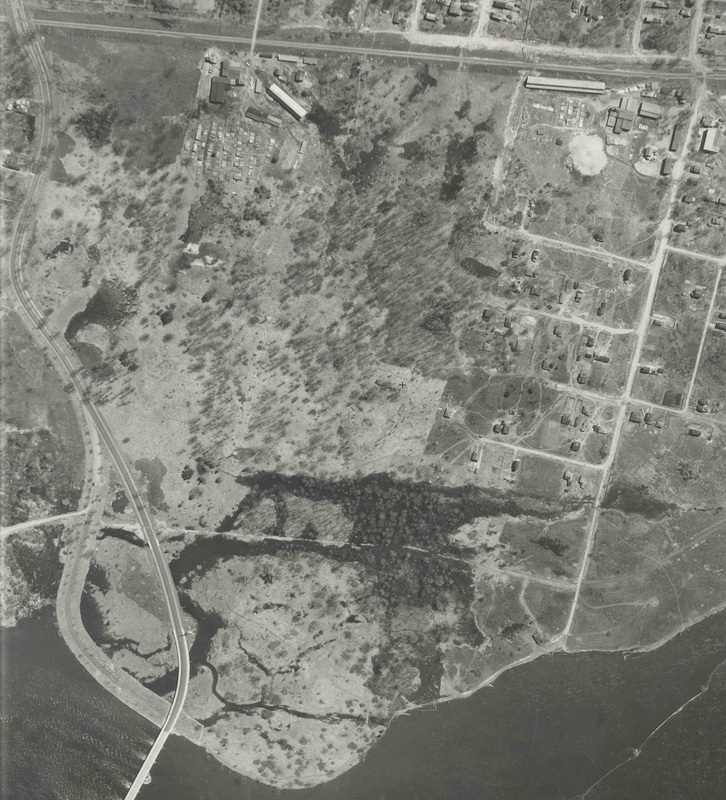 June 1961 view of the future site of Champlain High. 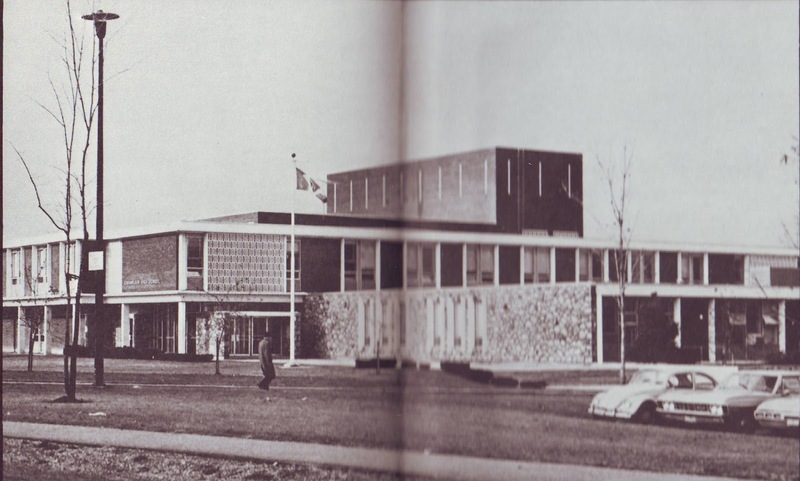 The planned "Scott Street High School"
The need for additional high schools in Ottawa was high in 1961, as the number of pupils continued to increase. The baby boom following WWII and again after the Korean War led to continuous growth within Ottawa's school system, not to mention the general trend towards more schooling for most of the population, which was still a relatively new concept (in 1951, 36% of 14-18 year olds were enrolled in high school; that number had increased to 49.9% by 1961). The working world had also changed, as there was a major shortage of jobs available for untrained youths. 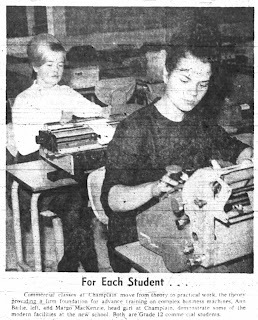 The media reported throughout the summer of 1961 of Ottawa's need for more schools. This, despite Hillcrest opening in 1961 as Ottawa's fifth new high school in five years. Substantial federal grant money was also offered to school boards towards construction of new schools. The boards were most certainly in a rush to get in all the construction they could before the grant money dried up. Some proposals pitched in 1961 included plans for a high school to be built on vacant land north of Scott Street, near the CBC building on Lanark Avenue, which would be required to be open no later 1966. 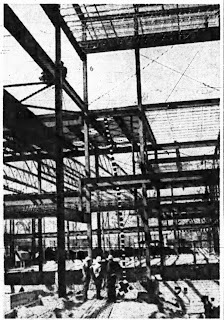 By October 1961, the Collegiate Board of Ottawa went to the Board of Control to request approval to construct a $2,035,200 school for 1,050 pupils, next to the CBC studios. Controller Lloyd Francis and other board members supported the location whole-heartedly, arguing that suitable sites large enough to handle a high school were rare within the City. The 13-acre piece of unused land had been put up for sale by the City, and the Collegiate Board had an agreement in place to purchase it. However, Mayor Charlotte Whitton preferred a block of land in Mechanicsville (essentially everything north of Burnside Avenue, which is now grassland and parkway space east of Hinchey, but at the time was still a busy, fully inhabited section of Mechanicsville). This part of Mechanicsville was considered one of Ottawa's main "slum areas", a target of the urban renewal project which was attempting to clean up the city of decrepit and dangerous housing. This site had earlier been targeted by Whitton for the location of the new "Eastern Ontario Trade School" (better known as Algonquin College) which instead was located out Woodroffe Avenue, where it of course remains today. City Council played host to a sparring match between Lloyd Francis and the Mayor, who argued not only about the use of the Mechanicsville site, which Francis stated could not be acquired and prepared quickly enough to meet the mounting school population (and which he insisted would cost more than $100,000 an acre, five times what Whitton argued it would), but also over the topic of the type of school it would be. Whitton was adamant about the need for more secondary school trades training. The media summarized the hostility: "The Controller (Francis) had to shout down Mayor Whitton before expressing his views from a prepared speech (in which Francis argued that Ottawa was starting to pay too much attention to commercial and industrial training for secondary school students). The mayor called him out of order and interrupted several times as he tried to get started. Mr. Francis called the mayor out of order for her interruption and told her to 'sit down or leave the chair.' Finally, by raising his voice above the shouting pitch already reached, he managed to outshout the mayor." In the end, Francis won out, and it was reported that "when he (Francis) was finished, Mayor Whitton, quietly this time, supported the collegiate board and the Scott Street plans." Enter Charlotte Whitton, who in the days following the announcement publicly expressed her feelings that it was "unfair" that the board would not provide the three acres, and wanted a meeting with provincial officials to clarify policies. Controllers Hamilton and Francis argued that any opposition she continued to lay would tie up development for a year or more, and may even lead to students having to attend school in shifts in area high schools. 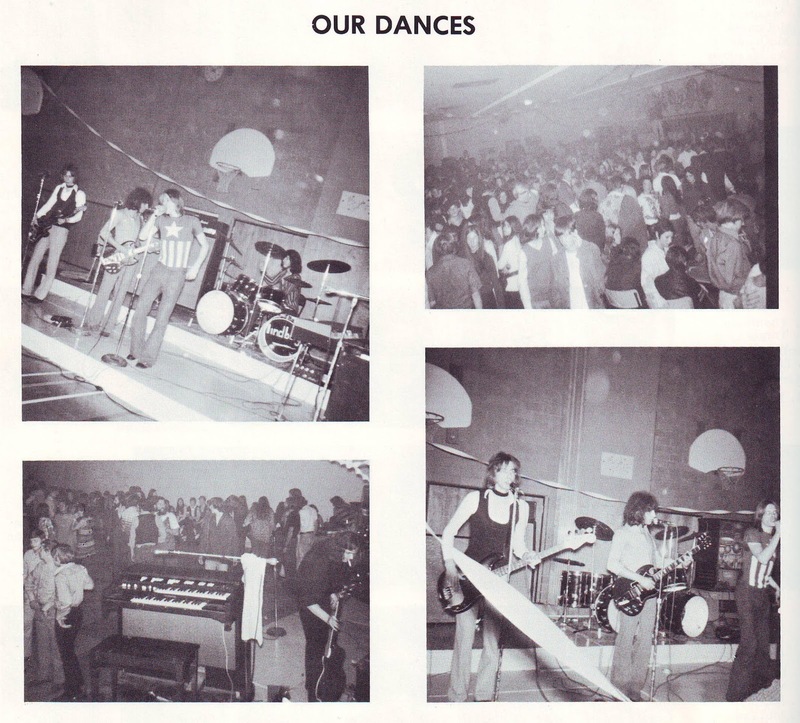 The Catholic group eventually pulled their request, and the plans for the high school on Lanark proceeded. 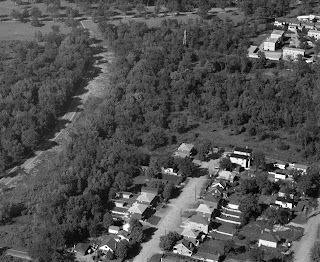 In March of 1962, the City formally transferred the 13.6 acre site to the Collegiate Board, for the price of $95,000. Interestingly, only 10.5 acres were purchased, the other 3 acres would be rented from the city for a minimal price. This was a strategic move by the City, who would use the 3 acres of owned land to count against their mandated requirement of parkland acreage to be maintained. 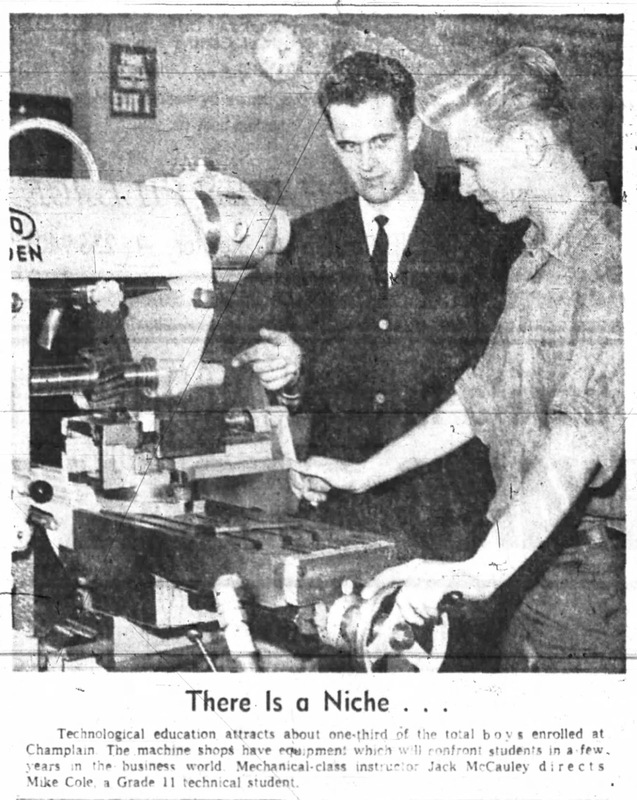 Construction was to begin in January of 1963, with school opening that fall. The construction cost estimate was in the $2M range, and federal grant money contributed a cool $1.26M towards it. (Announced at the same time were the terms of Tech High School's west wing renovation, and construction of new east wing, the full $1.6M price tag to be paid by the feds, as well as a substantial addition to the new Hillcrest School, for which the City and feds would each pay $625k). Throughout 1962, the proposed school was referred to as "Scott Street High School" and perhaps briefly that may have been considered as the actual name, however in October of 1962, the name "Champlain High School" was selected instead, an easy choice considering the proximity to the Champlain Bridge as well as the Champlain Park neighbourhood, which had recently been renamed (it had previously been known as Riverside Park). Architect firm Hazelgrove, Lithwick, Lambert and Sim prepared the plans and specifications for the school. It was designed to be virtually a twin of the Brookfield High School, which was built at the same time. 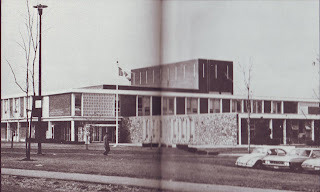 (For more on the architect firm, and the Brookfield connection, please check out this detailed Urbsite post on the history of Ottawa high schools built in the 50s and 60s at http://urbsite.blogspot.ca/2016/03/ottawas-high-school-architecture-mill.html). Urbsite noted that the both were to be "marked by granite fieldstone walls, more interesting massing and judicious splashes of orange." 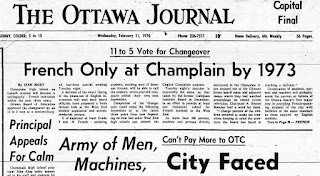 The tenders for construction of Champlain went out in November 1962, and indeed construction did begin during the winter (February-March) of 1963. 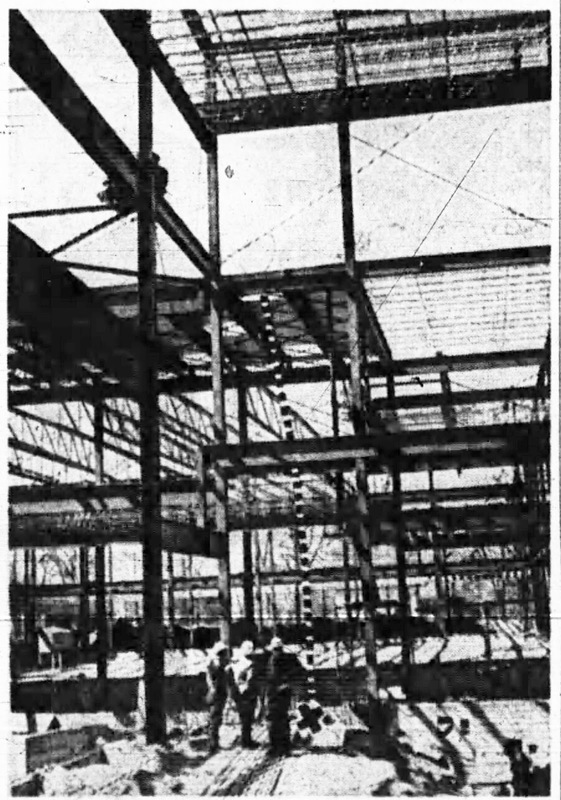 Champlain High School under construction - April 18, 1963. 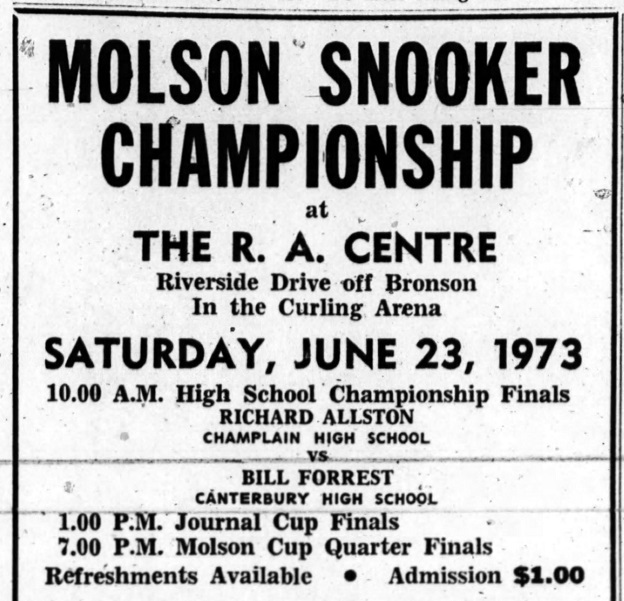 By June, plumbing was being installed, however work was held up for a few weeks due to a City-wide strike by the International Laborer's Union which was supported as well by the Ottawa Building Trades Council. Picket lines were set up at the school, crossed only by a few workers who picked up their tools. The announcement of of the first day of school for Champlain! The school was was able to open on time, and classes began on Tuesday September 3rd, 1963. Final construction and "finishing touches" continued into the fall, while students were already on campus. The school opened with an enrollment of 530 students in grades 9, 10 and special grade 11 commercial, and a staff of 30. The official opening of the school, and laying of the cornerstone, occurred at 3 p.m. on Tuesday October 8th, 1963. 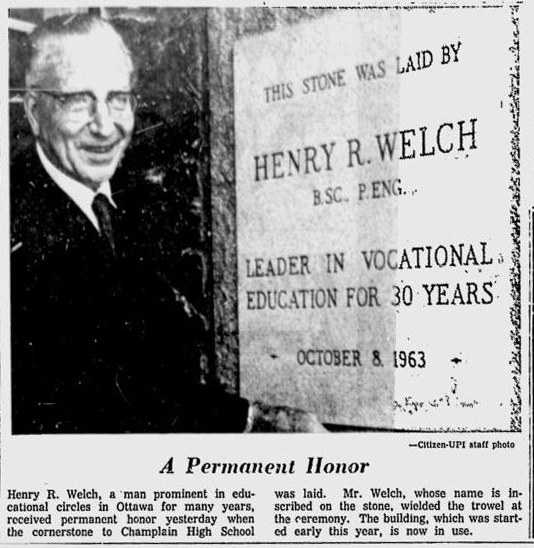 The stone was laid by Henry R. Welch of the Collegiate Board. Welch noted that the astrolabe had been selected as the school's official crest, which he hoped "will inspire and give guidance to its students", while another speaker John Y. Harcourt noted that the school motto was "Omnibus Consulamus", meaning "Consideration for All". 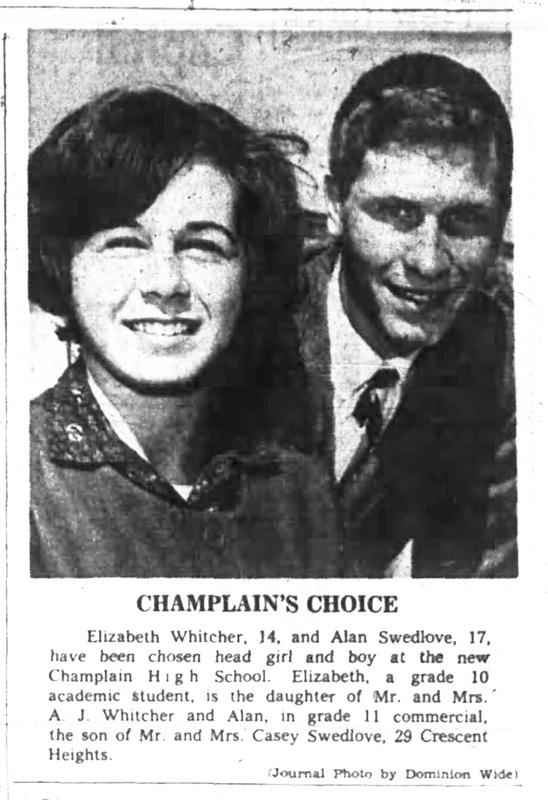 By the fall of 1964, Champlain had 800 students registered. 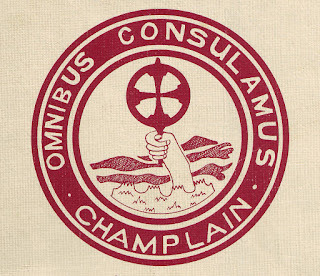 A profile of the school at that time noted that Champlain had a new combined two-year commercial and arts course "which requires only basic achievements in typing, layout and some office equipment operation", though some successful students moved into the four-year commercial course. 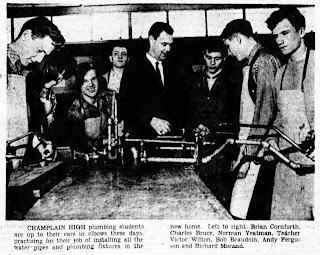 It also noted the technology and trades program at the school was expanding, adding a course in plumbing. A boys cooking class during after school hours had 50 students in it. The list of section heads were: Vice-principal Howard A. Barber; History, C. Merrick Band; Commercial, A. William Dervin; English, Owen C. Froggett; Mathematics, Lionel G. Hodder; Language, Sylvain Mayost; Physical Education, George L. Simonette; Technical, Samuel Storey; and Guidance, A. Earl Murdock. Victor Wilton, Bob Beaudoin, Andy Ferguson and Richard Morand. By the fall of 1966, enrollment was up to 1,110 students in grades 9 through 13, while staff had increased to 70. 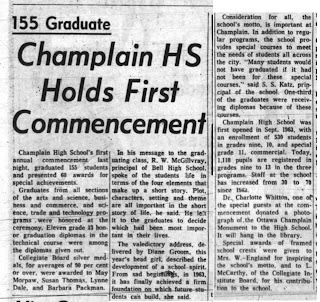 That November, Champlain held its first commencement ceremonies, where 155 students were part of the first graduating class. 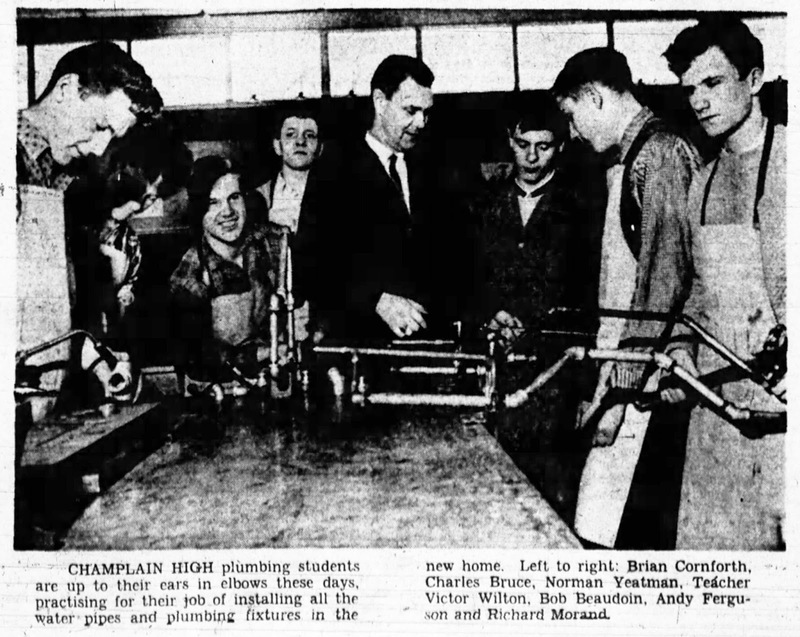 In January of 1967, an addition was announced for Champlain, which would include eight classrooms (later reduced to six), two science labs and two storerooms. The same architect firm (Lithwick, Lambert, Sim and Johnston) prepared the plans. Tenders went out in July for the $349,900 project, which was awarded to L'Abbe Construction Ltd. of Ottawa. Work began that fall, and the addition was completed by the fall of 1968. The board explained that the expansion was needed owing to the expanding population in the area, and specifically the increased enrollment in science classes. 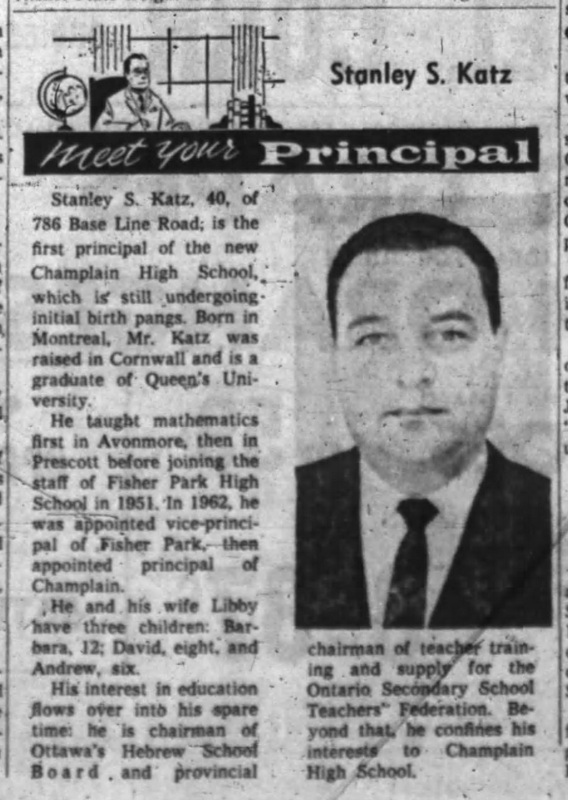 In June of 1969, former vice-principal John King was appointed acting principal of Champlain when Mr. Katz moved on. Meanwhile, that fall, the graduating class at commencement numbered 273 students. 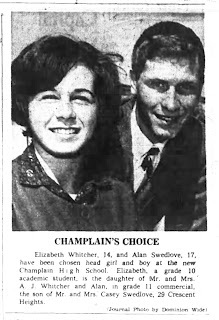 The initial proposal stated that for the following fall (of 1970), only French students would be accepted to grade nine at Champlain, while any prospective English students would be accommodated at Nepean, Fisher, Commerce or Tech. Staff and students alike were not happy with the announcement. 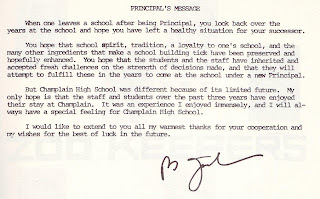 Even principal John King had non-supportive words in the media the following day (see below). In what seems like a 180 degree turnaround from the approach just a few years earlier of building new schools to keep up with the demand (not to mention the paint had barely dried in the new addition built at Champlain less than two years earlier), the Board defended their decision saying that they couldn't justify keeping Champlain English when there was space open at Nepean, Fisher and other schools, and while there was a need for a French high school. The Board argued that to keep English students at Champlain, it and possibly other schools would have to move to a shift system, or else taxpayers would need to cough up $5-6M to build a French high school. 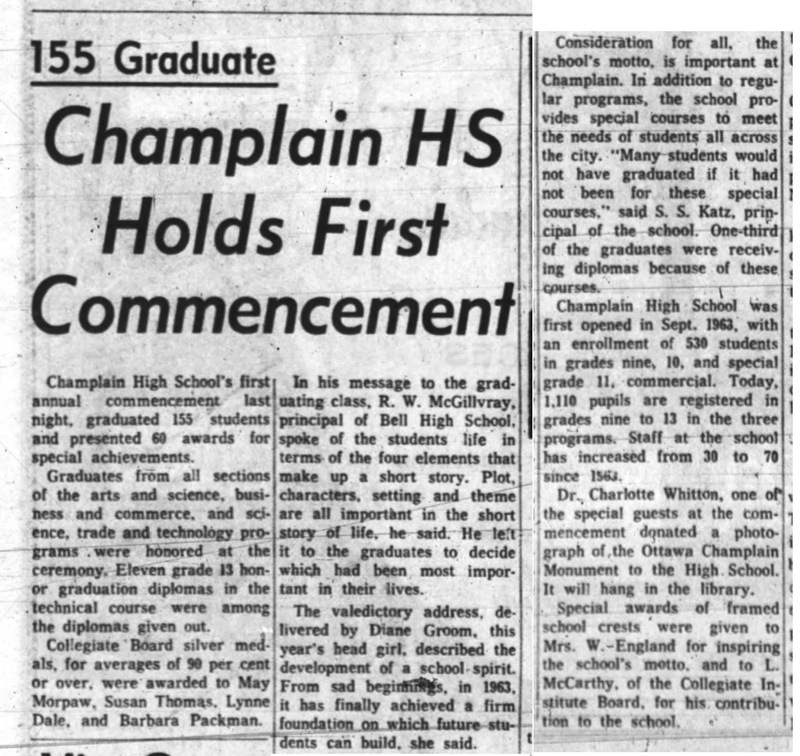 At that time in 1969, Champlain had 1,050 students and 69 teachers.Teachers worried about job security and the affect the change would have on their careers. An angry group of teachers met with Board staff in the library of Champlain the week following the announcement. 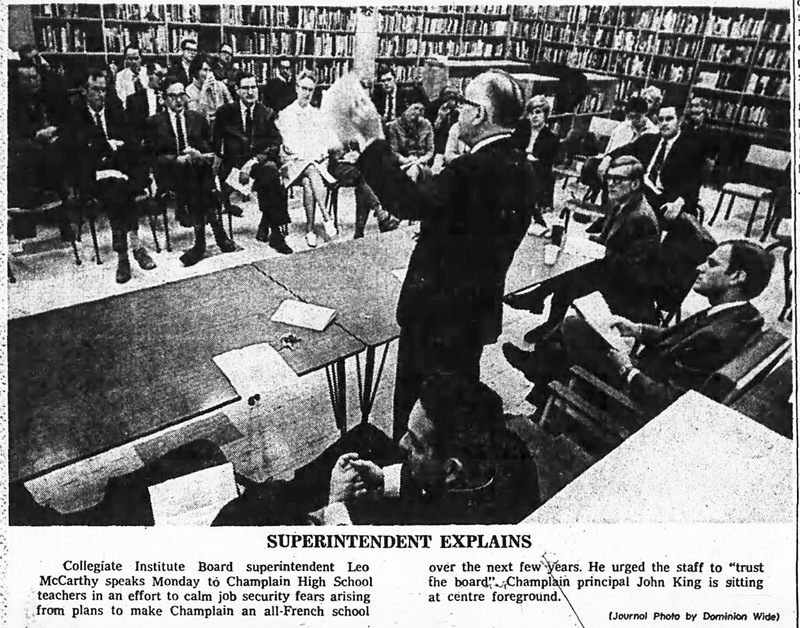 The Board was concerned about the negative reaction, and the threat of mass staff exodus in 1970, while teachers wanted written assurance that their jobs with the board were safe; particularly as the Board commented that night that in fact the school could even become 100% French in three years or less, rushing the phased approach. The night of December 17th, it was the parents turn to express their outrage at a meeting held in the auditorium. The Chair of the meeting set the tone early by announcing the plan was "only another step in making Canada a French nation", though many in the crowd did not agree with his extreme view. The parents actually were largely supportive of the idea of the school becoming bilingual, or even split (as was planned for Canterbury) but were universally against the transformation to an exclusively French school. Head girl Joan Hanna on behalf of the concerned students voiced that they were upset as that they had spent seven years building up school spirit. The assistant superintendent of the Board stated that a bilingual school was not possible, because the school was too small and that bilingual high schools were "difficult to administer", while he also discounted all other options, such as building a new French school, or converting another area school such as Nepean, Fisher or Commerce. The Ottawa Collegiate Institute Board was to dissolve on December 31st, to be replaced by the new Ottawa Board of Education. On December 29th, the Board in their final act announced they had changed their minds, and offered a compromise to the Champlain community. They decided that, for one year at least, the school would run as a split, bilingual school. 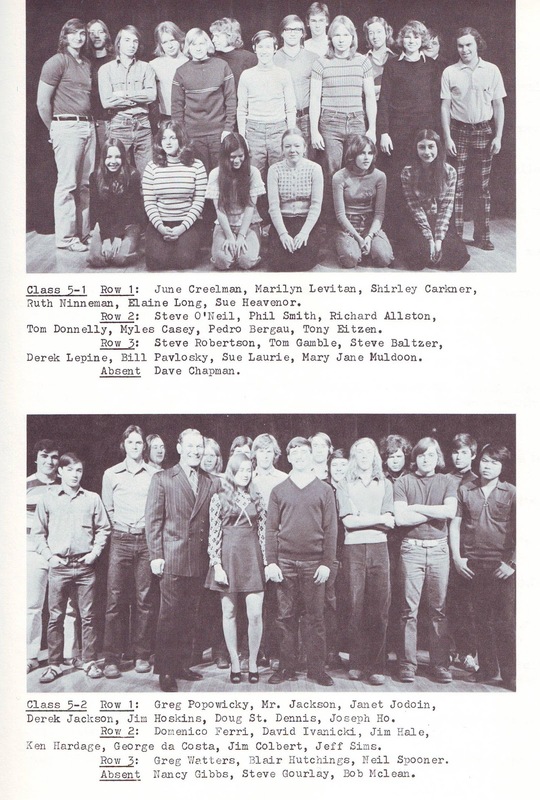 Both grade 9 and 10 French students would be admitted in the fall of 1970, as well as new grade 9 English students. This was not a well-received decision amongst the French supporters. 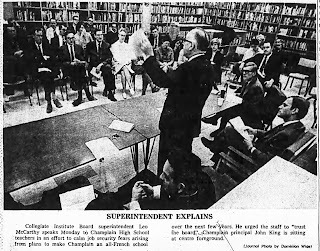 In January the OBE heard from a large group of 600 ratepayers who were pushing for Champlain to become full French-speaking school in September of 1970! They did not want a split school, citing that the "atmosphere is not conducive to developing a French cultural atmosphere". The debate raged into a full-on French-English battle in the west end. The OBE had to make a decision, based on student numbers and the overall financials. University of Ottawa professor Jacques Henri published a demographic study which showed there were 1,400 French students west of Bronson who would need Champlain that fall (later reports put the true number closer to 800, and it was also pointed out that many of those being included in that count were already attending English schools and likely would not decide to transfer to a French high school at that stage anyhow). The Board also was concerned about the seven expensive private French high school leases it had inherited. Meanwhile, the Separate school reps on the Board argued against the split school concept as well, with one board member noting "The French children would have to go in there wearing boxing gloves". It was also pointed out by the board research chief that moving the English students to other neighbourhood schools would solve one problem but create a new one, citing the overcrowding that would be caused, as there was not enough room for them. The issue became one of Ottawa's most controversial in early 1970, extending to both the general public and the political world. The historical battle between French and English was played out with combatants fighting for improved education. The issue became a microcosm of many of the language issues that existed in the era. Many editorials and letters to the paper were written, and it seems that everyone had a strong opinion one way or another. Passion and emotion was strong. It appeared the choice the OBE had to make would set some significant precedents, and school boards across Canada were following closely. 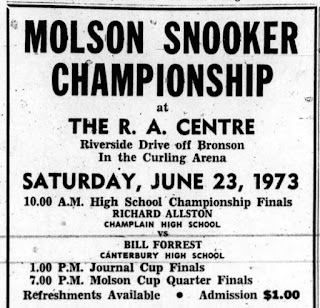 Later in January of 1970, the OBE's advisory committee on French-language education recommended that Champlain begin to transition in September 1970, bringing in all grade 9 and 10 students in the area, plus grade 11 and 12 students at the leased Notre-Dame du Bon Conseil girl's school on Bayswater, that no English students be admitted to grade 9, and as an interim measure operate as "two distinct and autonomous units." More public consultations and meetings were held. Students' council president Keith Bell, speaking on behalf of the English students of Champlain told the board that if they chose to convert the school into a French school that "it be converted to French entirely, instead of the proposed phase-out of English-speaking students over a number of years". He also asked the board to change the school's name if that decision were taken "because Champlain, as it is now known, would cease to exist." February 10th was a key day, the date of the board meeting where the OBE would be announcing their final decision. Local TV covered the meeting, and a large crowd attended in person. Several students marched in front the the OBE offices during the meeting carrying placards. Four and a half hours of emotionally-charged speeches led to many tense moments. Trustee Eileen Scotton had originally been in favour of the conversion, but voted against it, arguing that the French board members "have not given one damned inch since this whole thing began." A fellow trustee then argued Scotton shouldn't be on the board for changing her mind, and "degrading the intelligence of the board." Another trustee A. Sinclair Abell voted to keep Champlain unchanged, and smartly argued that he "did not see how the cause of national unity could be served by creating unilingual schools". The final vote count of 11-to-5 left many stunned: Champlain High would be French only by 1973. The next morning, an upset principal John King made a four-page speech over the school's public address system, "As principal no one is more disappointed than I" he said. He appealed to the students for calm and co-operation. Not surprisingly, the decision was fought by parents to the courts. A community group formed known as the Ottawa West English-Speaking Ratepayers' Association. They cited their primary goal as reversing the decision made on Champlain. They also argued that provincial Bill 141 allowed the French community to have extra representation on boards of education, enabling French ratepayers to elect four members to advisory committees while not making provisions for an English group. The group hired a lawyer and filed a writ in April in the Supreme Court of Ontario seeking an injunction against the OBE to halt the conversion. Arguments were heard in May, and the judge summarized the Court's role as being "not concerned with either the 'morality' or the 'common sense' involved in the board's action - only its right to take it." Ultimately the Supreme Court dismissed the injunction against the OBE, citing that there was no reason why the OBE could not establish a French school if it wanted. The group appealed one step further, to the Ontario Appeal Court. The case was finally heard in early October, well after the school year had begun with an all-French grade 9 class. That court also rejected the appeal, questioning the right of students to attend any particular school, noting "they are entitled to an education in a high school but the individual buildings are the instruments by which school boards carry out their legal obligation of giving an education." The issue was dead, and Champlain's fate was sealed. 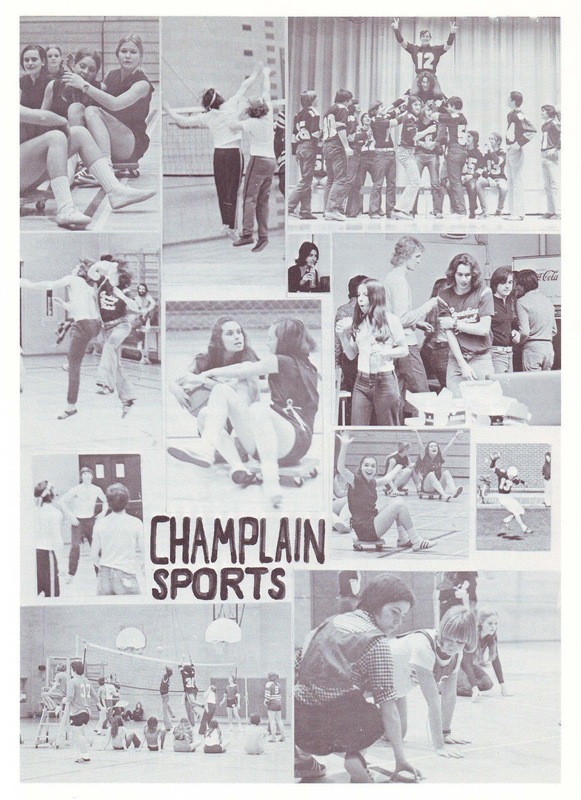 The decision was final and 500 French students started at Champlain in the fall of 1970, about 250 grade 9 students, plus all of the grade 10, 11 and 12 students who had transferred from Notre-Dame du Bon Conseil. Omer Deslauriers was appointed as principal of the French section. 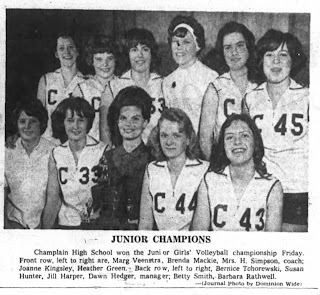 Meanwhile, the 300 would-be Champlain English grade 9 students were obligated to find space in other neighbourhood high schools; each of those schools would experience a strain on their capacity for the 1970-71 school year. A secondary issue was the toxic work environment for staff at Champlain, who would now be looking for new schools knowing that Champlain was in full conversion mode. 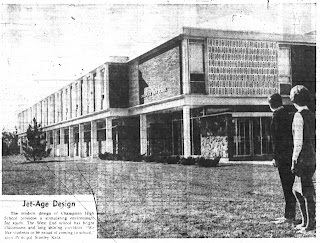 Meanwhile the fall of 1970 also saw Hillcrest High School be considered as the next high school to potentially convert to All-French. 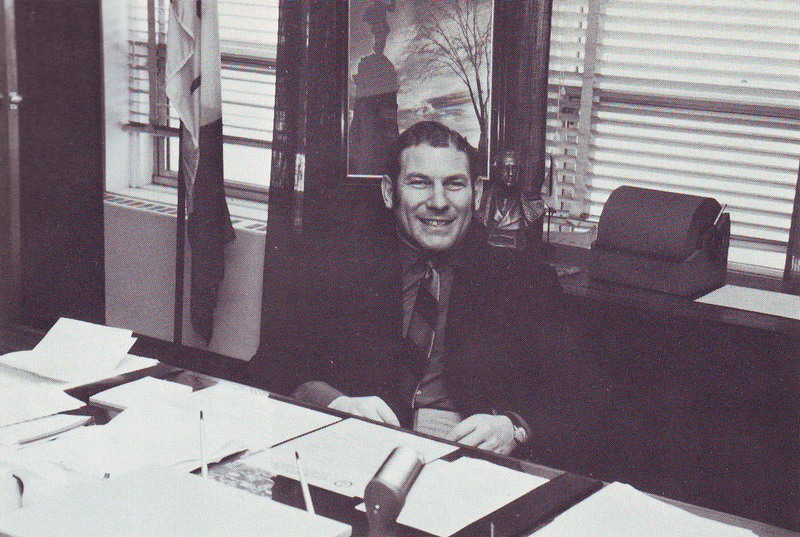 The fall of 1970 saw another notable event in Champlain's brief history occur, when Ottawa Rough Rider quarterback legend Russ Jackson was appointed principal of English Champlain. Jackson took over the difficult task of managing a school during a potentially contentious period. "I hesitated when they offered me the job but now it has become sort of a challenge to me", Jackson said a few months in. "It's difficult for teachers and students to put their best efforts forward in a school they feel has no future." Jackson had started his career in education in 1959 as a math teacher at Rideau High School. 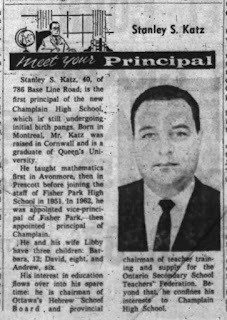 He was appointed vice-principal of Sir John A. Macdonald High School in 1966, before moving to Champlain for his first appointment as a principal. Jackson had retired from the CFL as a player in the fall of 1969 after winning back-to-back Grey Cups. He spent the summer of 1970 in Kingston working on his qualification certificate to become a high school principal, while also working with the Riders as a quarterbacks coach. He had also been hired as a colour commentator for CFL broadcasts on CBC. 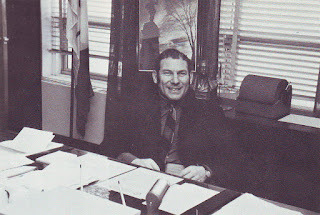 In December of 1970, just a few months into his tenure at Champlain, there were significant rumours that Jackson was going to unretire to play with the CFL's Vancouver Lions. The Lions had offered him $100,000 to play the following season. The rumours lingered throughout the winter, and finally in April, Jackson said he was done with football. "There is no deal with the Vancouver Lions, I'm a high school principal and I'm not going to play football. Speculation is ended." The Journal reported on October 31st, 1970, that the sharing of the school between the 500 French students and 620 English students was progressing well. A newspaper reported: "The facilities are not being overtaxed, there is much less tension and much more co-operation between the two language groups. Both language groups start and end their days at the same time and share the same lunch hours. French and English play on the same interscholastic teams and teachers of both language groups co-operate fully in planning academic programs. Last night the English boys danced with Champlain's 350 French girls at a school dance organized jointly by the students' councils of both school." "But we still have to talk English anytime we wish to associate with English boys", said École Secondaire Champlain student's Council President Helene Cyr, "and I don't think the English girls like us because their boys like us." My mom recalled that the students planned to stage a massive walk-out in the fall of 1970 (perhaps in response to the failed appeal to the Ontario Supreme Court), but Russ Jackson put a stop to it. She remembers him announcing to the student body that anyone walking out can "keep on going" and wouldn't be allowed to come back. There ended up being no student strike, and the matter was closed. As much as the media made it sound like a homogeneous environment, my Mom does not recall it being so; she seems to recall that the English and French kids both pretty much stayed within their own groups. 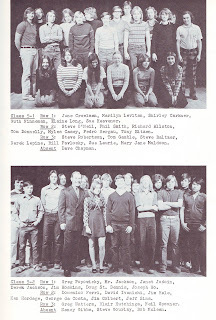 Certainly it was civil, and everyone got along, but ultimately it would have been a different experience knowing your high school's days were numbered. By 1971, the board began to be concerned about the future forecast of student numbers. 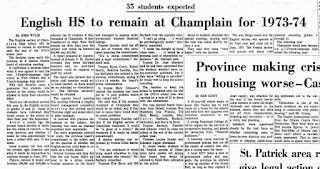 By stopping the enrollment of any new English students, as well as the departure of some students, Champlain was projected to have less than 140 students (88 in grade 12 and 50 in grade 13) for the 1972-73 school year, and just 35 for the 1973-74 school year; numbers far too low to administer and run a school. The board considered allowing new students to enroll in Champlain in grades 12 and 13 only (the only two grades still in operation) to boost numbers. They also considered simply moving all the remaining students to other schools. 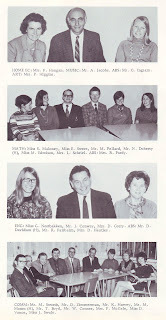 The board finally agreed that it would stick to their original commitment and voted 8-5 in November of 1971 to keep the English section going until the current students finished their schooling in June of 1974, regardless of the costs. 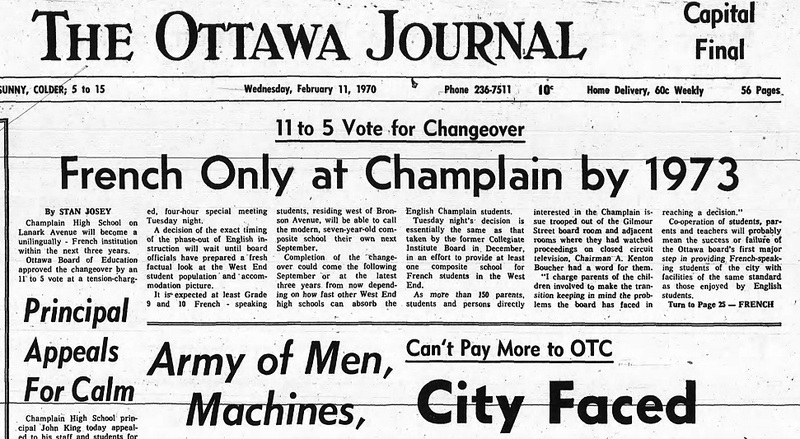 130 students and 20 staff remained at Champlain by February of 1973 (plus 966 in the French program), and the Board again was reconsidering their commitment in 1971. They called it a "delicate dilemma". There were 35 students projected to attend Champlain that fall, who had indicated interest 15 subject areas, meaning three full-time teachers and six part-time teachers would be needed for the grade 13 classes. The cost estimate to operate the school for the 35 students was $100,000. 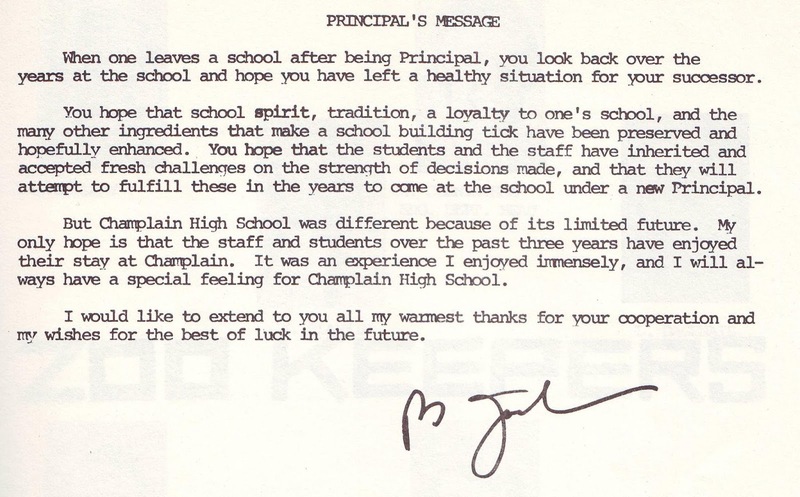 On top of this, it was announced Russ Jackson would not be returning to Champlain, and was named principal at Canterbury High. Board members debated the issue heavily throughout the winter, arguing it was a "firm and deep moral obligation" to allow the 35 students their education at Champlain, as was promised. 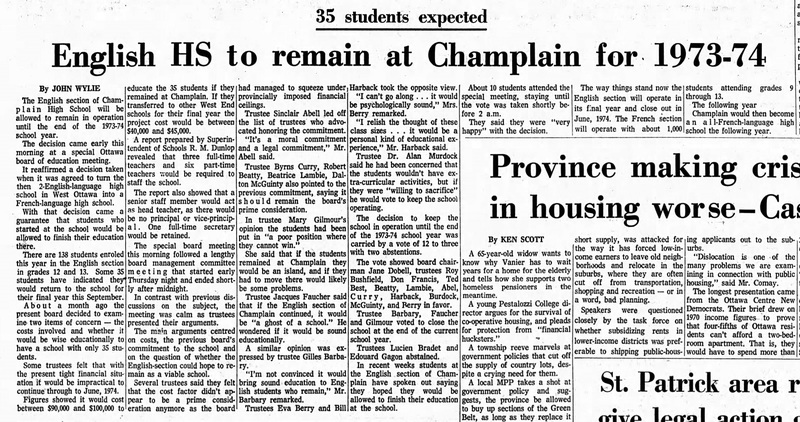 At the end of March, the board agreed, it would allow the final 35 students to remain at Champlain in 1973-74. 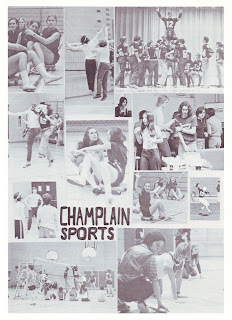 After June of 1974, the school continued in operation as École Secondaire Champlain into the 1990s. By 1991, the school had only 280 students out of its capacity of 1,181. The French public board acknowledged it was under-used, but argued that its relatively isolated location made it difficult to fill for any board. Some of the rooms were rented out for program consultants, students with autism, and the offices of the Ottawa-Carleton Learning Foundation. 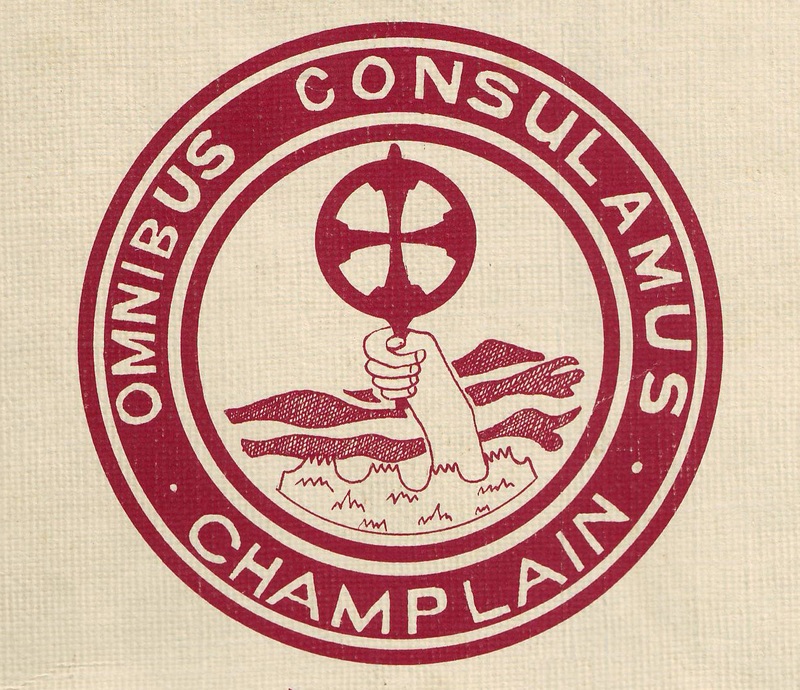 In 1991, Champlain became property of the provincial Ministry of Education, and the province planned to sell it by September of 1995. The board looked for alternatives for the vacant space, including moving grade 7 and 8 students from over-crowded École elementaire Charlotte-Lemieux on Bel Air Drive. In February of 1992, the OBE voted to move Connaught school's students to Champlain for at least a year, while the dangerous and over-crowded 83-year old building was to be rebuilt. However, The board was influenced by an offer from the Ministry of Education, who agreed to give the OBE $1.49M plus a speed-up on another promised payment of $5M, in exchange for the OBE allowing the school to be leased to Algonquin College. Algonquin was in the midst of constructing new buildings on Woodroffe and required the temporary space. The OBE took the new offer, and scrapped the Connaught rebuild, much to the frustration of Connaught parents and staff. Around 1997, the school was sold and became the Centre Jules-Léger, which it continues as today. Centre Jules-Léger was established in 1979 as a school for students with severe learning disabilities under the stewardship of the University of Ottawa. Today it continues to provide a curriculum and residential program for students with severe learning disabilities, as well as for programs and counselling services for deaf, blind or low vision students. It is Ontario's only school for francophone students who are hearing impaired or living with severe learning disabilities. There was some discussion in 2016 that its future was uncertain and potentially would close, after enrollment had dipped to as low as an anticipated 45 students for the 2016-17 school year (it has space for 330). 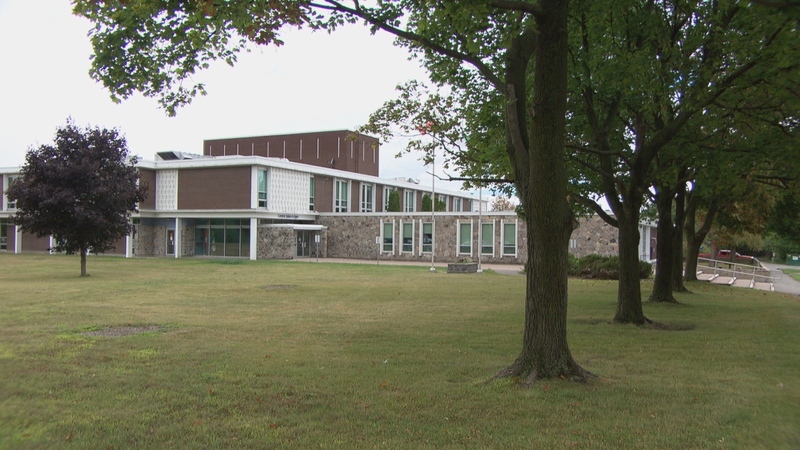 However, it was announced last fall that the Association des conseils scolaires des écoles publiques de l’Ontario (ACÉPO) would be taking over management of the school, which was expected to assist in regrowing the school. 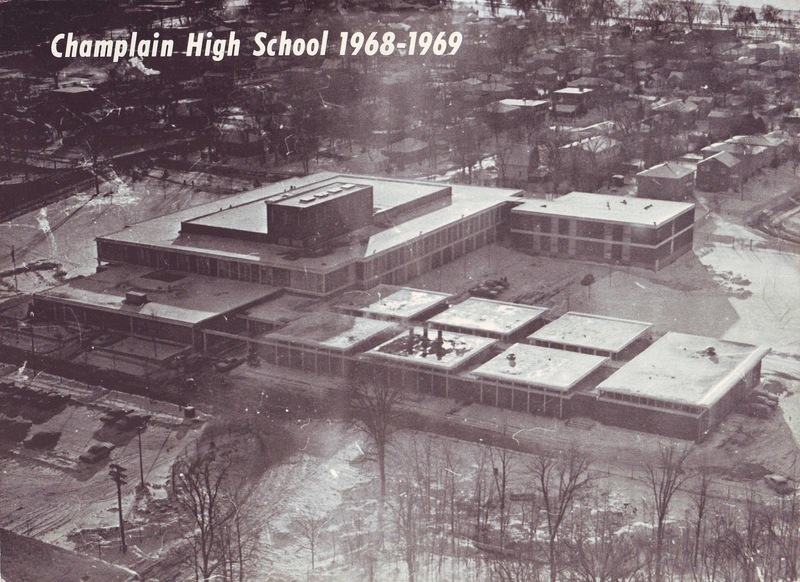 The former Champlain High School at age 54 years.